Professor Dorothea Dietrich, Chair, contributed an essay, “Hanover: ‘True Art’ and ‘True Dada’: Das hohe Ufer (1919-20); Der Zweemann (1919-20); Der Marstall (1920); and Merz (1923-32), to The Oxford Critical and Cultural History of Modernist Magazines, Volume III, Europe 1880-1940, Part I, Peter Brooker, Sascha Bru, Andrew Thacker and Christian Weikop, eds., Oxford, Oxford University Press, 2013, 947-968. 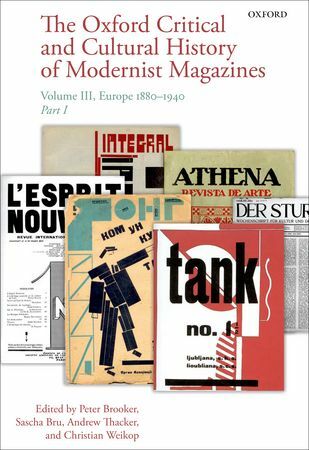 The third of three volumes devoted to the cultural history of the modernist magazine in Britain, North America, and Europe, this collection contains fifty-six original essays on the role of ‘little magazines’ and independent periodicals in Europe in the period 1880-1940. It demonstrates how these publications were instrumental in founding and advancing developments in European modernism and the avant-garde.